Proof of a settlement in Dawlish did not come until 1044 when King Edward the Confessor, the last Anglo-Saxon king of England, granted the parish of Dawlish to his then Chancellor and chaplain, Leofric, on the condition that he built bridges and supplied soldiers to construct defences in time of war. The charter explaining this donation is kept in the archives of Exeter Cathedral and is well preserved. Much of it was written in Latin, although the boundaries of the land donated were given in English (Anglo-Saxon). This is the oldest record of Dawlish in history. However, it is quite possible that a community existed centuries before, even back to the period of the Saxon invasions in the 5th and 6th centuries AD, as the parish church of Dawlish was dedicated to St. Gregory the Great. When Leofric arrived, the manor of Dawlish extended from roughly Teignmouth in the south to Cofton and Cockwood in the north, and the top of Haldon Hill in the west. It was a large area, mostly uninhabited and covered in thick forest, as it would have been difficult to cultivate with poor soil. The main reason that settlers established a ‘village’ in the area was that it was protected, sheltered on three sides by hills and on the remaining face by the sea. The presence of the sea provided limited food, while the wooded area harboured animals which gave meat, and wood for burning to give heating and a method of cooking, as well as for building. The presence of several fresh water rivers gave drinkable water. Work was provided by cultivating salt marshes which also gave a method of preserving food but above all gave trade with other communities. At this time the settlement which grew into Dawlish was not on the coast, the sea was feared by most, nobody knew what was ‘over the water’s edge’, it was known by locals that damaging storms emerged from the sea which also flooded the land, so they kept clear of the coast line. Evidence of early farming settlements were found at Aller Farm, Smallacombe, Lidewell and Higher and Lower Southwood. The name of Dawlish has developed over the years, the earliest spelling recorded is ‘Doflisc’ (Anglo-Saxon) or ‘Dolfishe’ (Latin), The exact meaning or derivation is unknown although it is thought to have meant ‘a fruitful mead in a bottom, or on a river’s side’. Throughout the 1st century Dawlish was referred to by many names, but before that Dawlish had been synonymous with ‘Devil Water’ and after with ‘Meadowland by Running Water’, the latter being the motto adopted in the 20th century by the local council. Other local history will tell that the name ‘Devil Waters’, manifested from the red waters which flow from the hills after heavy rain - this still happens today and it is quite frequent to find the stream running through the town bright red in colour after heavy winter rains. At the time Deawlisc (Dawlish) was a poor community, there was virtually no way of travel, the only ways in or out would have been over very rough cart tracks on to Haldon. Early maps show one track headed towards Luscombe Hill and on towards the Teignmouth direction and one went in the direction of Ashcombe and towards Exeter. A more substantial track existed between the port towns of Exeter and Teignmouth and was met by the tracks out of the Dawlish community. When Leofric died in 1072 he gave his Manor of Dawlish lands to the Dean and Chapter of Exeter Cathedral. The area then remained under Church control until 1807. After Leofric’s Death in 1072, Dawlish is mentioned in the Doomsday book, outlining the land and property owned by Bishop Osbern, Leofric’s successor. It quotes that the bishop had 30 villeins (a villein was a person bound to the land and owned by the feudal lord), eight bordars, three serfs, three cows, two swine, 100 sheep, a coppice three furlongs in length and one in breadth, six acres of meadowland and 12 acres of pasture. It was valued at just £8 a year. The Doomsday entry shows that Dawlish had cultivated land with sheep as its main wealth. The villeins would have lived in cob houses that clustered around the church and worked the Bishop’s land. They would have lived mainly off beans, fruit and hard bread with lard whenever they could get hold of it. Local cider and beer would have been produced, providing a safer source of liquid than the water at the time. The population of around 400 in 1080 grew only slowly, sickness was rife and the only real developments came as land was improved and better food became available. Records show that the Black Death, or Bubonic Plague, came to Dawlish in the 1340s and 1350s which almost wrote off the entire local population. By this time some more wealthy gentry were starting to emerge, and these people were able to escape the effects of the plague as they seldom left their estates, not coming into contact with the sick working classes. The plague returned to Dawlish again in 1629. The Industrial Revolution, when it arrived in Dawlish, made significant changes to life, and the village quickly developed into a small town. The first industrial change was the operation of two flour mills, powered by water wheels, fed from the water course through the town. One, built in the late 1600s was located in what is now Brunswick Place and the other, in around 1730 in Church Street. A further mill was located near to Ashcombe. By the end of the 18th century life in coastal towns such as Dawlish was starting to change for ever, the fear of the sea was receding and people started to extoll the virtues of fresh sea air and possible healing qualities from the sea waters. Dawlish found itself fashionable with the well off or gentry. At the time travel was virtually impossible and the gentry were the only group who could afford to travel via private coach. Few indications exist, but it is widely considered that Dawlish did not have a regular (if you could call it that) stagecoach until around 1812. The new wealthy visitors to Dawlish changed the face of life for the area for ever, with transport so difficult visitors arrived for long durations often with extended families complete with servants typically for an entire summer season. In terms of town development this was fruitful, for many enjoyed the area, purchased land and built new property. The types of Cobb-built cottage properties in the village at the time were not what the gentry sought and thus the area of residence spread further, especially along the banks of the Brook. Soon a number of fine houses and even villas were built using new and improved methods of construction allowing the previously unthought of position for many adjacent to the sea. Indeed some early documentation actually refers to ‘sea views’ and bathing potential! After sea bathing was recognised as a healthy and pleasurable past time, it was still very much a gentleman’s ‘hobby’. Ladies seem not to have been welcome to sea bathe until the latter part of the 19th century. By 1803 Dawlish development was moving forward fast, Dawlishownian John Manning masterminded improving the land either side of the stream or Brook which ran right down the middle of the community, which eventually allowed modern houses to be built closer to the sea front. His work physically straightened the town’s water course, while embankments were built. This work led to the development of a new street, Pleasant Row, which is now known as The Strand. Many people often wonder why the two main roads of Dawlish, either side of the town, are so far apart, even with the relatively narrow water course down the middle. The reason lies in the problem of flooding, which although slightly controlled, has never gone away, even today. Heavy rain on the hills to the back of the town builds up both capacity and speed as they rush downhill towards the open sea. If a high tide, compounded by a south west wind hits at the same time the water from the hills has no where to go and floods the lower part of the town. One of the first reported incidents of serious flooding causing major damage was in 1810 when fast flowing waters washed away eight new bridges, much of the then newly created public lawns, embankments and two residential properties in what is now Brook Street. After this disaster The Brook was altered, and weirs built to prevent a recurrence. At this time, the grass area in the middle of the town was still grazed by sheep. As Queen Victoria arrived on the throne, early plans were being drawn up to bring the railway to the town. A number of propositions were put forward in the 1830s, which led to the building and opening of Isambard Kingdom Brunel’s Atmospheric Railway in 1846. The railway suddenly brought new life to the town. Many hundred ‘navvies’ worked on construction of the line by digging cuttings and boring tunnels. One of the most momentous days in Dawlish history was on Saturday 30 May 1846 when the first passenger train operated; by todays standards it was slow, but the news paper of the period hailed the train “taking only 40 minutes to reach Dawlish from Exeter”. It is fascinating that the opening of the railway made Dawlish the first seaside resort to be served by railway west of Weston-super-Mare. At the time, long distance transport was very much the preserve of the upper classes. The majority of people toiled six days a week and had to attend church once or twice on Sundays. Little time existed for people to visit the seaside except at Bank Holidays. 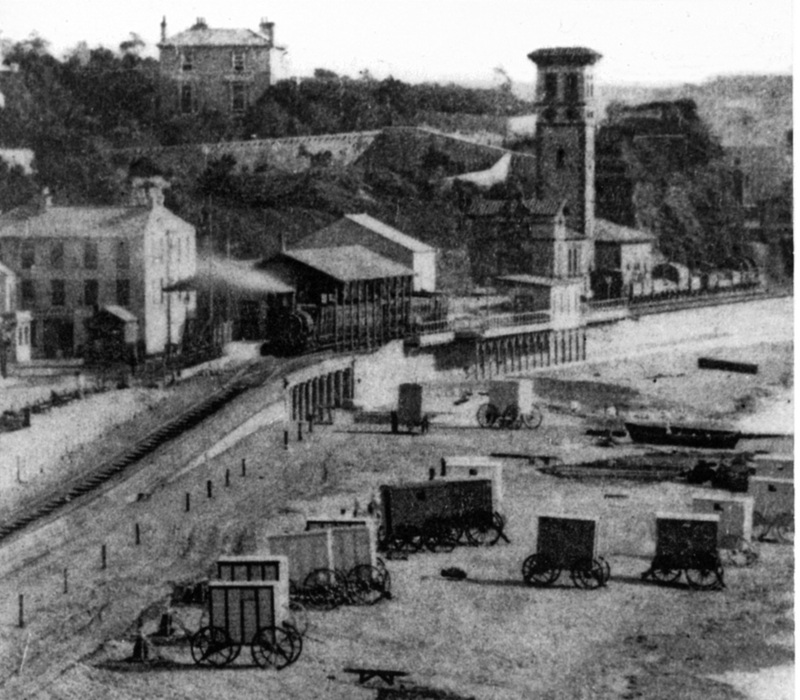 Development of Dawlish slowed towards the end of the 19th century, but increased wealth for the town meant that living standards improved and saw the introduction of gas, a usable water supply, sewerage systems, and even street lighting. Household electricity was also laid on for those with sufficient funds. Protection and safety of town folk also improved with a police office opening in 1857, (which is more than the town has today). A Coastguard look-out was opened in 1868 to provide some protection for mariners. In 1906 a New Zealander introduced the now famous black swans to Dawlish Water or The Brook. John Nash, a Dawlish-born man who emigrated during adulthood but paid frequent visits to the town decided that the town needed some form of uniqueness. The Black Swans are still to be found on Dawlish Water, but today are supplemented by dozens of other species. In the early 1900s, some workers from bigger businesses and employees of the gentry began to receive paid holidays. This saw a major upturn in visitor numbers to the town, with some deciding after a couple of visits to settle in the area. These increases in numbers saw some smaller housing erected (quite large by todays standards) in streets such as Luscombe Terrace and Hatcher Street, while open spaces in other ‘older’ roads was built over with quality housing. World War I stopped most further building until the early 1920s. After the First World War was over, Dawlish became even more established for the day tripper. This had an adverse effect on town life which became less gentrified and more suited to the lower classes. The one and two week annual paid holiday became the norm and more and more people wanted to travel to the seaside town, mainly by train. At around the same time wealthy folk from industrial areas, especially London, Birmingham and Liverpool started to visit or retire to the area, this all leading to the once elegant villas being turned into hotels and guest houses. The area just east of Dawlish, which became known as Dawlish Warren owes its success to the Great Western Railway who first built a station known as Warren Halt close to Langstone Rock in 1905. Prior to this, only a few large houses and mansions were to be found on the hill behind the Warren. By 1929, with the introduction of air travel, Dawlish even had an airport! The Great Western Railway built a small aerodrome on Haldon, to serve the greater Torbay area on a Cardiff to Plymouth route. The Second World War saw an end to the poorly patronised service. However, the airport remained in use for many years under military control. Remnants of the old airfield can still be seen today. 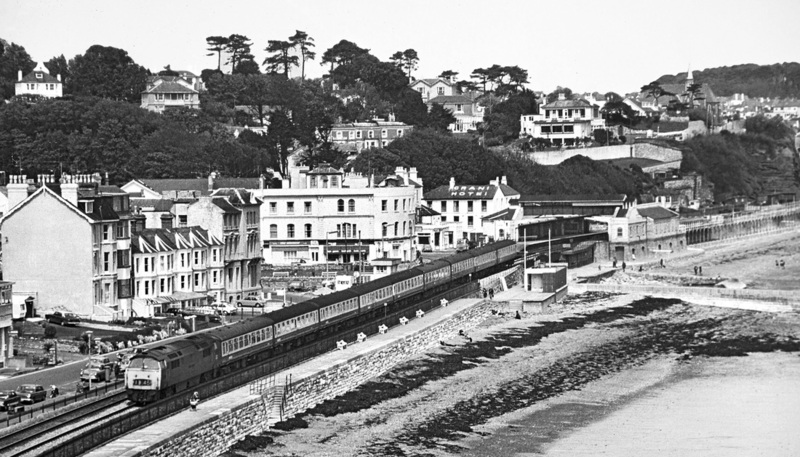 By the 1930s Dawlish had become popular as a low budget holiday resort with holiday camps and caravans turning up. The railway played a major role in this, bringing literally thousands and thousands of people to the area every summer, with through trains from most corners of the UK. The outbreak of World hostilities again in 1939 brought further development to a halt and considerably slowed down holiday travel. The Second World War also ended a plan which could have seen the railway disappear as we know it from Dawlish sea front, with plans put forward by the Great Western Railway to build a Dawlish ‘cut-off’ from Powderham via Gatehouse and Weech Road, making Dawlish served by a branch line. If this plan had been furthered, it would have gone right through the author’s house! In 1953, the year Queen Elizabeth II took the throne, the town of Dawlish adopted the Latin phrase ‘Pratum Juxta Rivos Aquarum’ as its motto, which translates (literally) as ‘Meadowland by Running Waters’. The heraldic emblem of the town incorporates the arms of Edward the Confessor (top left: a cross patonce between five martlets, blue in colour), those of Leofric (top right: a dark cross with a bishop’s mitre at the centre), and of the See of Exeter. Holiday travel started to resume after World hostilities ended in 1945, with massive growth in holiday trade in the 1950s. This generated much business for the newly formed British Railways and remained through the early 1960s. By the 1970s, the town and surrounding area was starting a major change; the annual UK holiday was becoming a thing of the past, with low-cost, easily-accessible air travel tempting the previous UK holiday maker to seek pastures new. The hotels started to close and be demolished, to be replaced by retirement and second home accommodation, to such an extend that by 2012 Dawlish only has just one large hotel of merit! The guesthouse market was also adversely affected by the changing holiday patterns with properties sold off for cheap one-room housing, while others have been demolished and rebuilt as high-price nursing homes. The vast majority of remaining holiday accommodation in the area now concentrates on huge camp sites offering a range of packages from self-catering holidays to sites to pitch your own van or tent. It is said that the camp sites in and around Dawlish, Dawlish Warren, Starcross and Teignmouth offer a staggering 20,000 beds. 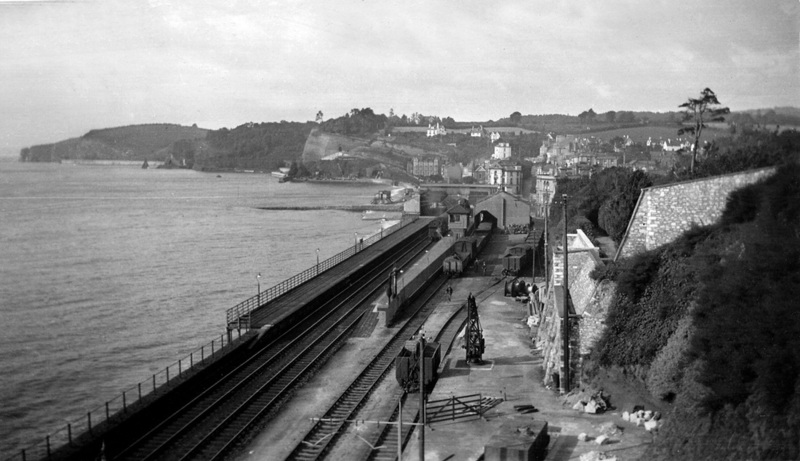 Dawlish station from the Coastgurads bridge in 1951.